This sign at the access from Delamere Terrace to the canal towpath seems illogical. It reads "Cycling not permitted - pedestrians have priority". 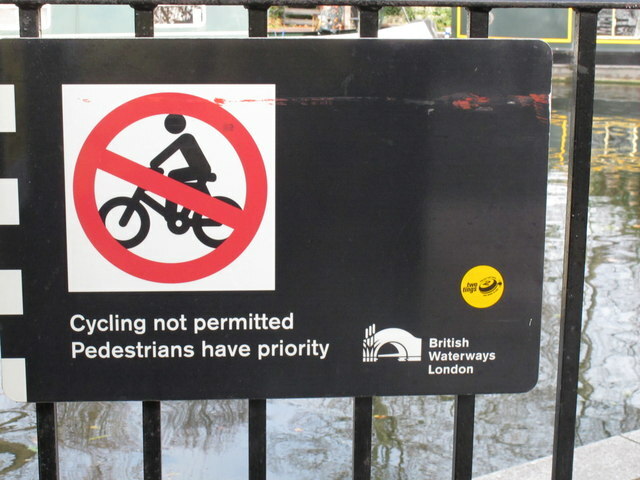 If cycling is not permitted only pedestrians are allowed, so over whom do they have priority? Incidentally, the "No cycling" sign as given in the Highway Code does not have a bar across the bicycle - but the sign as shown here makes it clearer that cyclists are not allowed. A collection of photos and descriptions to show the bridges on the canal from Paddington Basin to Bull's Bridge. It will show whether access to the canal towpath is by steps, ramp or level access, and indicate the type of surface of the towpath. St Mary Church Paddington Green. 12 metres south-west of Church of St Mary. edge and swept cover with further gadrooning surmounted by shallow pediment. the east side commemorates J A Thrupp (d 1844) and his wife Caroline (d 1842). and their granddaughter Caroline (d 1845). Is anyone able to take a picture of it sometime?